Owner Managed-One of the nicest in town! Have a multi-day ski or summer event with your friends or family. This condo is perfect for 2 families or a group of your best friends to have a weekend or week to remember. Brand new carpet, 4 flat screen TVs, pool and hottub right outside the back door. Washer,dryer. Great views. 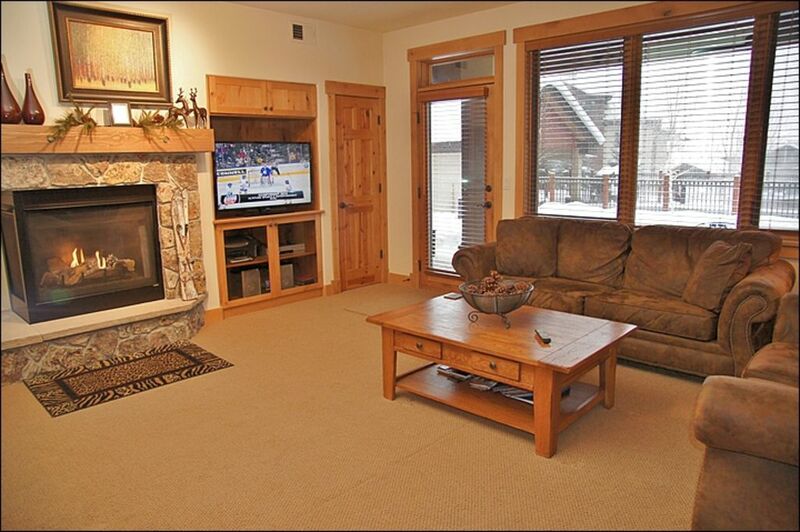 Our condo is located at the Trappeurs Crossing in Steamboat Springs, CO. This double master suite luxury condo has underground heated parking and ski concierge and free shuttle to anywhere in town. Known as one of the nicest condos in Steamboat. Our patio opens up to the outdoor pool and hot tub and grilling area. The developers spared no expense! Pets are NOT allowed, No Smoking. And we ask guests to remove their shoes. It is about a 400 yard walk to the gondola or you can take the free private shuttle, that will pick you up and drop you off right at your doorstep. The shuttle will also take you anywhere in the town of Steamboat. No rental car is needed!!! No problem to fit 2 families. The Queen Bunk Beds are one of a kind in the third bedroom. Please call or e-mail with your inquiries (see below). Was the absolute best! Steamboat is our favorite and we always try to stay here when we can!! It was beautiful, spacious, and had everything we needed. Waking up to mountain views, walking to the hot tub, and the shuttle to the mountain right out our door — was so great! Thank you! We enjoyed our stay and the house was beautiful. Access to the hot tub and pool couldn’t be be better. The shuttle system was awesome. Exceptionally relaxing and peaceful... felt right at home! Fabulous place! Convenient location and all the amenities anyone could need. The owners were fantastic. Couldn’t have been nicer. We loved it! We would definitely rent here again in the summer and winter. Roomy and comfortable ground floor unit adjacent to the pool makes access a breeze especially for the grandparents who accompanied us. Happy hours for the adults and ice cream socials the kids plus ping pong , foosball and tennis to keep everyone busy. Ready to explore - then walking distance to the Gondola with its many activities and restaurants. Downtown is only a ten minute drive and the Emerald Mountain Trail system is amazing for hiking and biking. Book it and enjoy! My family and I really enjoyed our stay. The condo was very spacious, and clean. We could walk out easily to the pool and hot tub. It’s also walkable to restaurants, shops, ski rentals and the ski hill. The condo has a heated garage with its own space and two lockers for skis. Everything was very convenient. My family of four really loved it. My daughter said it was her most favorite place she’s ever stayed. Highly recommend.